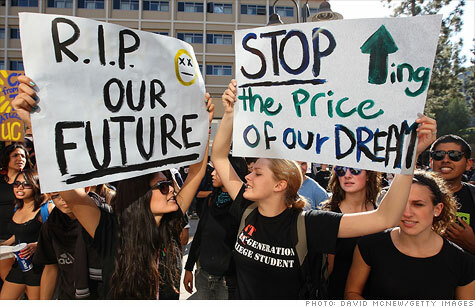 Students protesting the rising cost of higher education. Interest rates on subsidized loans are set to double. WASHINGTON (CNNMoney) - With little more than three months until the interest rates on federally subsidized student loans double, students are pushing lawmakers to help them out. On July 1, the interest rate on federal subsidized loans will double to 6.8%. That means students taking out loans for the next school year will eventually dig deeper in their pockets to pay them off. Nearly 8 million students have subsidized student loans, which means the federal government subsidizes the interest rate for lower- and middle-income families based on financial need. Without congressional help, students borrowing the maximum $23,000 in subsidized loans are poised to pay an extra $5,000 over a 10-year repayment period. That's why the consumer advocacy group U.S. Public Interest Research Group delivered 130,000 student petitions to lawmakers on Capitol Hill on Tuesday, asking Congress to stop the rates from doubling. I agree with those students because if they can't pay for college or books and they can't pay for necessities what will they become? Keep interest rate DOWN!!!! !